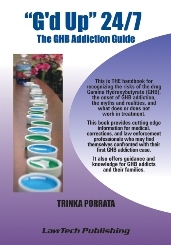 This is THE book about GHB addiction and is geared to medical, corrections & law enforcement professionals who may encounter GHB addicts in their work. It is also designed for family and friends of GHB addicts and addicts. It is unique and thorough. It makes a great gift for your local counselor, addiction treatment center, library, jail or probation/parole office, ER, etc.